Chem-Dry Dust Mite Anti-Allergen is an anti-allergen aqueous solution containing naturally occurring elemental rock and extracts found in plant seeds. The active ingredients work instantly by neutralizing and rendering harmless the protein allergens created by dust mites. It is not a drug or pesticide and it is harmless to humans and animals. It contains no CFCs and is fully degradable. Dust Mite Anti-Allergen is suitable for carpets, bedding, mattresses, upholstery and all household items and will effectively control major causes of asthma and rhinitis related to dust mite allergens. It does not contain tannic acid and will not harm most fabrics or interior fabrics. Dust mites are too small to be seen by the naked human eye. They measure only 0.2-0.3mm in length and have translucent bodies. Dust mites feed on organic material such as flakes of shed human skin. One person shed enough skin in a few days to keep 1 million dust mites alive and happy. Our lovable pets like cats and dogs create even more dander for the mites to feed on. It does not sound good, but we share our beds with anything between 100,000 to 10 million dust mites if they are not controlled. Luckily the do not bite, sting or hurt one. It is when we breathe in their excrement that causes the allergies like asthma and coughing. One day’s excrement of a dust mite weights 6 times their body weight. Brisbane and surroundings is a preferable area as they prefer warm, humid environments. Dust mites live in our beds and in dust collecting carpet. They got their name because they eat dust and dead skin cells. Their residue then becomes airborne with dust and causes allergies when people inhale the particles in the air. Children and the elderly are mostly affected by dust mites. During the colder winter months we close our homes and the concentration of the dust and faeces increases in our homes as there are less ventilation in the house. Most dust mites are found in beds and bedding, because we provide a good meal for them when we revisit our beds every day. The worst is that we spend more than a quarter of our life in bed, together with these nasty creatures. In some people the affect might be minor like the irritation of the respiratory passages which causes nasal congestion. This will give effect to symptoms like a running nose, hay fever, sneezing or coughing. Blocked sinuses will eventually give result in headaches which can be chronic if the cause of the problem is not treated. 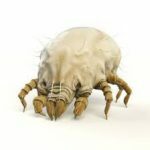 Due to the fact that they cannot be seen, one would suspect a dust mite problem if one of the above symptoms exists. The fact that they are so common, makes it unnecessary to test for them, as they would probably be present in a sample. Something common and easy to do, but we do not often vacuum our beds. Normally we would vacuum our carpets once a week, and it would be a good idea to do the same with our mattresses. Because they are so tiny and light, millions of them can be removed this way. Before vacuuming, always dust the window sills, skirtings and areas that keeps dust. Bedding should be washed regularly in very hot water. A more controversial suggestion is not to make your bed in the morning. Kingston University in London has made a study and have shown that if your sheets are exposed to air, so that they can dry out, the will be a considerable reduction in the amount of dust mites in your bed. There you go – now you have a good reason not to make your bed. Our first action would be to clean and sanitize your carpets, mattresses and upholstery. We strive to deliver a healthier and cleaner environment for you and your family to live in. Chem-Dry Amazing use The Natural®, a proprietary warm water cleaning solution that utilizes the power of carbonation to raise filth to the area where our powerful suction tools whisk away the dust mites and dirt. After the cleaning process is completed, we apply dust mite anti allergen and finally deodorize your carpets, mattresses and upholstery – leaving them tidy, deep cleaned and refreshed.